I wrote some notes…NOW WHAT!? Prelude to the Afternoon of a Faun, or if you understand French, Prélude à l’après-midi d’un faune, is an exemplary piece if you are wondering about developing your melody or motive and finding a contour to your melody. A contour is like a general shape to a melody or phrase, it is not entirely based on the pitches themselves, but the overall shape the pitches make. Prelude to the Afternoon of a Faun, written by Claude Debussy (1862-1918), is considered by some to be the first modern piece of music. By contrast, there are many scholars that argue that Tristan und Isolde, by Richard Wagner (1813-1883), is the first modern piece. 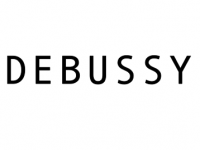 Debussy utilizes non-traditional scales (meaning not just major and minor), chromaticism, parallel voice-leading, and bitonality or bitonal chords (two different chords at once). He blurs the definition of many established musical conventions. side note: Here is Leonard Bernstein discussing how Debussy creates musical ambiguity. Leonard Bernstein (1918-1990) is DEFINITELY someone you should become familiar with if you have not discovered him already. Bernstein was a great conductor, composer, pianist, author and educator. If you’ve seen West Side Story, you know Bernstein! His musicality was exceedingly phenomenal. He heard music in ways the composer didn’t even know he/she wanted. At times, his choices seemed controversial. Bernstein took risks, but never without purpose. There was always reason for his choices. Debussy writes with form in mind, but makes his own rules. He writes with tonality in mind, but sort of goes where he wants when he wants. He is not confined by the rules of the late romantic period, which was prominent during his early years. He was more concerned with how he wanted his own voice to sound. 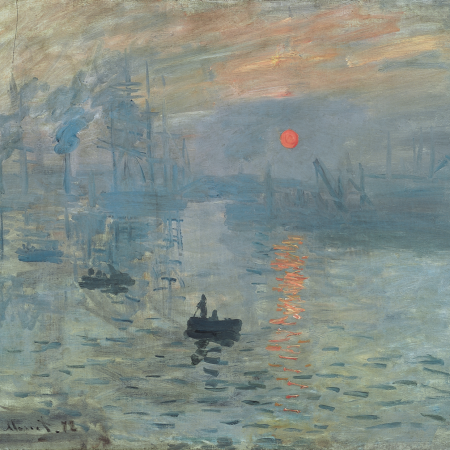 A similar trend in visual art at the time was Impressionism. Basically, do you know the artist Monet? Remember the painting Water Lilies? Claude Monet intended to blur the definition of the painting world, literally, by making a blurry effect. In contrast to representational painting, Monet was interested in ideas which manifest in the mind. He wanted you to get the overall feeling, or impression of the painting/mood. He wanted the onlooker to feel something through his personal filter. 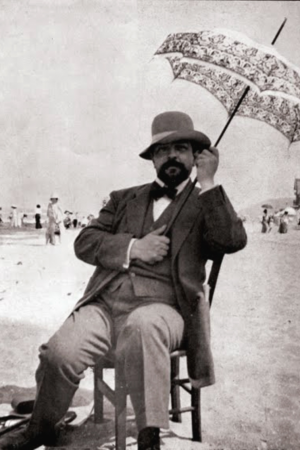 Debussy wanted you to feel something through his personal filter as well. At times, he was less interested in specific key relations, and more interested about the shape of the contour. He blurred his lines by using tools like: non-traditional scales, formal freedom, tonal ambiguity, and imperceptible metric pulse. Mood and atmosphere were more important than concrete images. One piece where he really dives in to this ambiguity is Prelude to the Afternoon of a Faun. Prelude to the Afternoon of a Faun is a symphonic poem. And what in the world does that mean? A symphonic poem is an “orchestral form in which a poem or programme provides a narrative or illustrative basis.” (Oxford Music Dictionary Online) The symphonic poem arose during the height of Romanticism because composers wanted to be incredibly expressive and mushy. But as the world turns, so do people’s manner of thinking. The symphonic poem died out as a form eventually because the composer-mind wandered over to a more abstract way of thinking with independence of music as a major factor. Basically, a symphonic poem is any story, poem, painting, book, or something external to provide an element of programming that helps define the mood and structure of a piece. Prelude to the afternoon of a faun was inspired by the also-titled famous poem of Stéphane Mallarmé (1842-1898). A faun is a half human/half goat mythical creature from Ancient Greek mythology. Have you seen The Chronicles of Narnia? Or read the book? Mr. Tumnus, he’s a faun. Ok now let’s listen to the music shall we? Feel like a dream? One of the reasons is that melody. It moves chromatically down to a tritone and back up again. Take a pencil and mark whenever you hear the melody that starts in the first measure in the flute. See how the flute starts on a C sharp in measure one and travels down to a G natural and stays there for a bit? The interval that Debussy has chosen to outline is an augmented fourth, or in other terms a tritone. It is called a tritone because it is comprised of the distance between three contiguous whole steps. It is also the interval that sits perfectly in the middle of the octave. Many composers avoided the tritone for a long time because it was considered the Devil’s interval. Composing with this interval at the time was unusual. Debussy chose this interval for its ambiguity. The tritone does not function in any key. So again, the melody starts on C sharp in the flute and travels down to G natural and back up to C sharp. This is repeated once more starting on measure two, before providing some space for the melody to keep climbing before a fall into what sounds like E major that then resolves to dominant of E-flat major, (which is totally weird and cool and not at all expected under the umbrella of TONAL music). Rehearsal marker 1, shows the second return of the melody. Look at it, does it look different? It is almost exactly the same except for the last note which is held a little longer. Now let’s look at the third time it occurs on rehearsal marker 2. The melody still starts on a C sharp, but look at the first note. It lasts longer right? Now look at the next 9/8 bar. See how the melody still has the same contour but it is filled in a little and extended? Instead of ending on an A sharp, the melody overlaps its ending with the start of a new beginning on an A this time. However this iteration of the melody does not outline the tritone but rather the interval of a perfect fourth. And instead of one climb and fall, Debussy uses the method of sequences to elevate us more so that he can fall even further back down with the melody, extending our anticipation and expectation. Now, at the top of page 7, we are back to the original C sharp, but Debussy knows you’ve already heard his melody 4 times and wants to take you to a new place, so his material becomes more swirly, so he can take you through different tonal areas. And for the first time on page 9, he gives you a different instrument to carry the tune. Write your own melody, or dust off an old one you have put in your ideas folder. Figure out the contour of your melody. Draw out the melody on a piece of blank paper. What does it look like? Maybe like this or this . Think about ways to extend parts of your melody or provide elaboration. Examples: start the melody on a different note, think about different high or low points of the melody, think about different key areas (if it is tonal), augmentation or diminution or rhythmic material. You may wish to flip the melody upside down or start it from right to left. You may also approach this exercise with the drawing of a contour first, and then fill in the notes after. This may provide more artistic freedom. Vaslav Nijinsky was a famous Russian ballet dancer and choreographer. He worked with many famous composers including Igor Stravinsky, and choreographed a ballet to Prelude to the Afternoon of a Faun. Here is a production by the Paris Opera Ballet with Nijinky’s choreography.